This volume presents the first translation into a western language of the earliest known version of the great Tibetan history known as the dBa’/sBa bzhed. The original version of this famous text, traditionally attributed to sBa/dBa’ gSal snang, is believed to have been written in the 9th century, but until now the only extant versions, which are much reworked and which date back to the 12th and 14th centuries, have never been translated into English. In 1997, in Tibet, as the result of the co-operation between the Tibetan Academy of Social Sciences and the Austrian Academy of Sciences, a manuscript of 31 folios came to light in Lhasa bearing the title dBa’ bzhed, and the telling subtitle: “The Royal Narrative (bka’ mchid) Concerning the Bringing of the Buddha’s Doctrine to Tibet”. This text is now presented as a joint publication by the two Academies in a facsimile edition with an annotated translation. 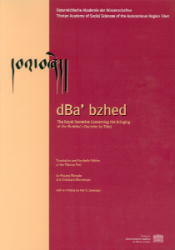 The outline of the events narrated by the dBa’ bzhed corresponds to a large extent to the known versions of the sBa bzhed: a detailed account of the foundation of the monastery of bSam yas (the first Buddhist monastery in Tibet, consecrated in A.D. 779), the famous doctrinal debate which took place there in A.D. 792-794 and the political and religious conflicts which relate to the establishing of Buddhism as the dominant religion in Tibet during the reign of Khri srong lde btsan. There are, however, considerable differences in the dBa’ bzhed from the extant sBa’ bzhed versions in the mention of numerous historical details and in the narrative. These elements indicate that the dBa’ bzhed pre-dates the extant sBa’ bzhed versions, or at least represents an early and different elaboration drawn from the ancient sources of this tradition. The style of the text suggests that it belongs to a transitional stage between the archaic dynastic Tibetan seen in Dunhuang materials and early classical/canonical Tibetan. The 164 page book includes an annotated translation and a photographic reproduction of the Tibetan text, together with an introduction by the authors and a preface by Per Sørensen, with assistance from Charles Ramble and Luciano Petech.